Take the boiled potatoes and mash them. Add the golden brown onions, remaining garam masala, cumin powder, green chillies, coriander, salt and mix well. Now make a boat-shaped patty and put in the keema. Close the patty. Make a thin batter of refined flour and water and dip the patty in this watery mix. Now coat the patty with semolina on both sides and deep-fry in hot oil. 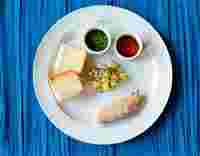 Serve the cutlets with tomato, coriander chutney and pao bhaji buns. Recipe courtesy Puja Sahu, The Pot Belly, Shahpur Jat, New Delhi.